The songs on Pokey’s transformative new album MANIC REVELATIONS demand your attention. Here, you get the feeling this man is constantly reshuffling the deck in favor of some outcome or other. Each chord, each riff shades the stories he sets up in his lyrics. But make no mistake – no matter how the cards lay, he is searching for the purest truth; he loves laying in the muck. Whatever it takes to serve the song. He wouldn’t know what to do if his life were any other way. In conversation, he’ll stare right through you as you speak. They call it the Quiet Eye. It’s that uncanny ability the best athletes in the world have; it’s what sets them apart. Pokey has it too. You see this with pitchers in Pokey’s beloved game of baseball. A guy can look at a complex scene and instantly focus on what he needs to do to get a strike. In a noisy stadium, there’s a focus from the mound to the catcher’s mitt. That’s the game. In a flash, the ball moves at 90-some-odd miles per hour, and the fate of an entire city hangs in the balance. When that pitcher’s focus delivers, a game is won – and a banged up old Midwestern city like St. Louis is instantly elevated to an all-century high. But Pokey has no intention of winning any accolades with his music. He just wants to get more at home with the noise in his head. Comfortable would be nice, but nobody’s ever heard Pokey speak of a dream of an easy life. Those types of songs are for somebody else to sing. Pokey LaFarge makes good truck out of this thing that he pushes against – whatever it may be in a given moment. 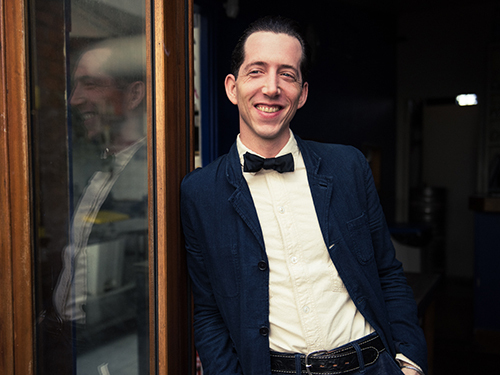 Pokey LaFarge is a musician. He is a storyteller. He is a feeler of feelings. He is a narrator of the messy, unkempt American experience. He sits, he watches, he writes. Everything that’s worth happening happens in his songs. Like the long line of writers and performers he descends from, music isn’t something Pokey does – it’s something he is. True to this statement, there are no lookback songs on MANIC REVELATIONS. This album is all about looking outward, looking forward – and we’ve never seen Pokey’s observational craft in a more stark relief. This hasn’t happened by chance. Artists who write from real life experience have no choice but to change themselves if they want to progress their art. With this in mind, Pokey has been hard at work pushing out the corners on himself.